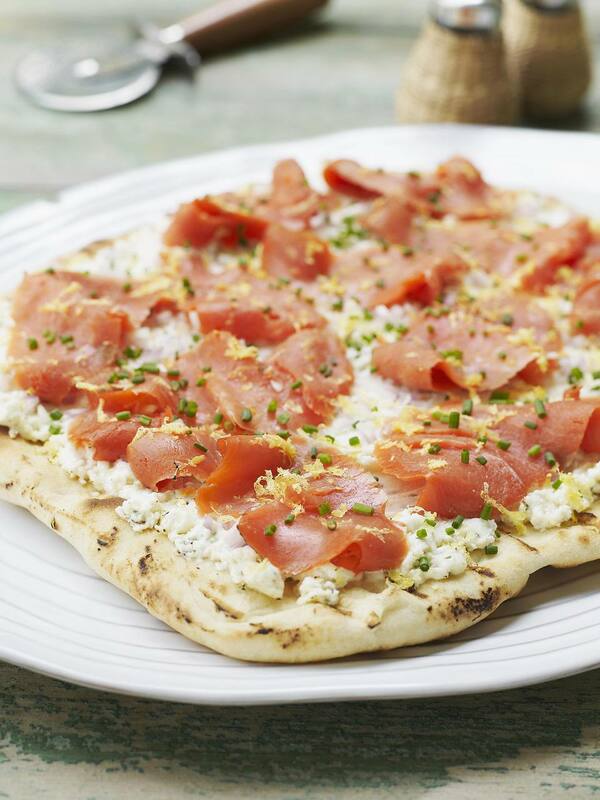 A Boboli crust, some canned salmon, and a few additional ingredients make a delicious and different pizza. that is ready in about 20 minutes, start to finish. You could use focaccia bread in place of the Boboli crust, or bake your own pizza crust, either from scratch or use frozen pizza dough or a refrigerated product. For an elegant version of this recipe, omit the red bell pepper and green onions and used smoked salmon. You could use fresh dill instead of the dried if you'd like, or try another herb, such as thyme or even a bit of rosemary. Or you could make it with canned tuna. This recipe is versatile! You can double or triple this recipe easily; just use more pizza crusts. Preheat the oven to 400F. Place the Boboli crust on an ungreased baking sheet. In a small bowl, combine the softened cream cheese and the sour cream and mix with a spoon until smooth. Spread this mixture evenly over the crust. Top with the salmon, red bell peppers, green onions, cheese, and dill weed, arranging the ingredients evenly over the pizza. Bake at 400 degrees F for 11 to 14 minutes or until the cheese is melted and the pizza is hot.